A project is a framework (structure) used to organize work-group tasks. Projects identify the body of work to be completed by a team within your organization. Projects can have multiple levels and complexities, depending on the needs of your organization. A project manager adds a project to OfficeTimer, specifying the client the project is being completed for, if applicable. The project manager specifies who will be working on the project. If the project is being billed to a client, the project manager sets the billing rates for the project. The project manager creates tasks within the project and enters estimates. The project manager specifies which expenses can be claimed under the project. When entering time on their timesheet, users working on the project allocate their time against the project and task. Users also select the project when entering expenses. The costs and billing charges associated with the time and expenses are automatically calculated by the system. Time and expenses can be exported for client billing. Additionally, the project manager can periodically review the actual costs against the estimates, to ensure the project is on track. Management of Projects is located under (Left Navigation Menu–>Administration>–>Projects). The system allows you to create an unlimited number of projects for users to log their time, expenses, and mileage against. The system uses a hierarchical tasks structure and allows unlimited levels of tasks under any parent project. The main Project screen serves as the master control panel for all project creation, modification, and deletion. 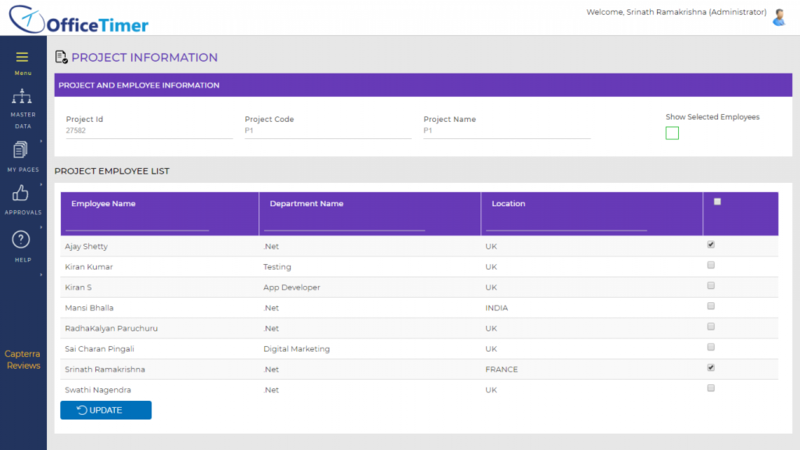 The Projects page provides a list of projects defined within OfficeTimer. Projects can be added, edited, or deleted from this page. (Use project roles billing rate)Billing rate should be picked from role wise billing rate of that project. One of the first actions that should be performed on any new installation of OfficeTimer is the creation of the various projects that your organization will be used for the time, expense and task management. To add a new project, follow these instructions. Enter project information in client project form. Click on[Add]to add this project. In[Project List], click on[Delete]link of record which you want to delete. In[Project List], click on[Edit]link of record which you want to modify. Update your required modification in[Client Information]form. 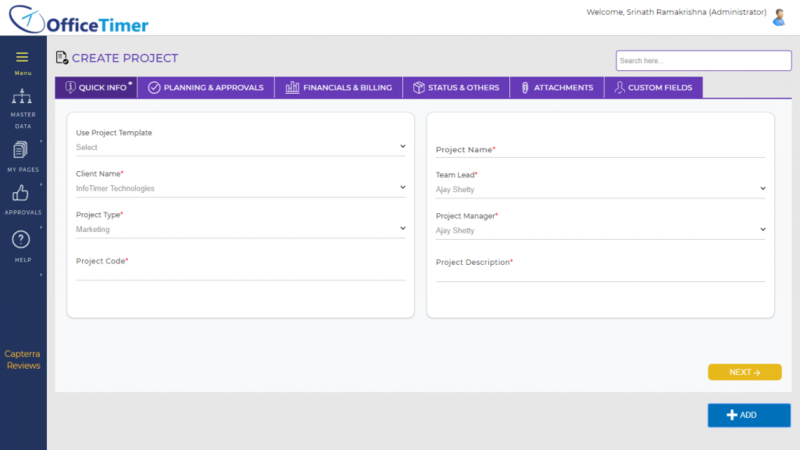 On project add, OfficeTimer automatically redirects to project team page where an administrator can select employees which he wants to be in this particular project team.